Probably only a handful of the young generation know that Jakarta’s zoo used to be at the present day Taman Ismail Marzuki and that the streets of the neighborhood, on its opposite side, was once called Jalan Kebon Binatang (or literally, Zoo Street). 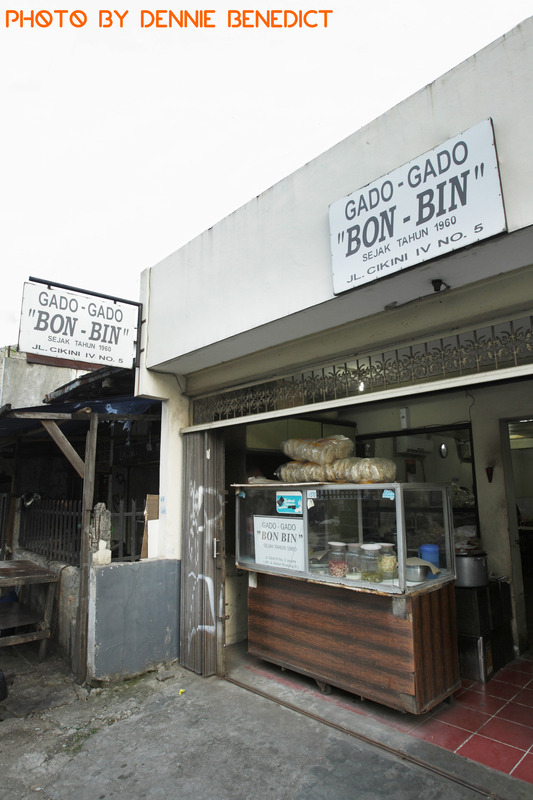 The neighborhood itself harbors interesting eateries that, in time, we will reveal for you our benevolent readers, but certainly we can always start with one of the oldest – the Gado-Gado Bonbin. As we all know, the peanut sauce plays a highly important role in many genuine Indonesian dishes and gado-gado is among that owes a lot to the silky, rich flavors of this dressing. It’s easy to find generic gadogado on street vendors and even five star establishments proudly offer this traditional Betawi cuisine for their customers. But of course, one must strive to be different if they want to be recognized. With a recipe that has stood proud for the last five decades, Gado Gado Bonbin’s version is perhaps among the best in Jakarta. Why the name ‘Bonbin’ you might ask? Of course, because it’s a portmanteau of Kebon Binatang, the name of the street where it resides on before it got renamed Jalan Cikini after the zoo was moved to Ragunan. The owner said that back then, the portmanteau has, somehow, a good vibe in it and that the teenagers in those days used this word a lot. But let us return back to the food. For the dressing, Gado-Gado Bonbin chooses to roast the peanuts rather than frying it, thus avoiding the excess of cooking oil to make it healthier. They also do not grind the peanuts too finely and maintain the subtle crunchy textures within this smooth and silky dressing. The rest is pretty much the same routine with fine additions of blanched vegetables from long beans, bean sprouts, cabbage, spinach, cucumber, topped with fried potatoes, tahu, and really good homemade rice cakes. Usually in many street vendors, the peanut sauce has to be dissolved first with water to make it less thick and then mixed with the vegetables on a mortar. Bird-eye chilies can also be added by request. However, Gado-Gado Bonbin’s peanut dressing is already well prepared and all they need is to assemble the vegetables upon a plate and then pour the dressing all over it, hence the term ‘gado-gado siram’. Additional toppings are also prepared to make the gado-gado even more delicious with fried shallots, emping, and a thick shrimp cracker. The homemade sambal is provided separately. Even with this fantastic recipe, Gado- Gado Bonbin clearly has gone way past its heyday. Mr. Hadi Lingga Wijaya, its current second generation proprietor, honestly admits that business has become slow nowadays and they have to close at 5pm every day, which is rather in contrast during the 80s when they can only close only after 8pm because everybody flocked in all the time. “It is probably because of the appearance of shopping malls and people can go look for other places to eat”, he sighed. Some conservative eateries like Gado-Gado Bonbin and others around the neighborhood do suffer from this kind of development, but some others chose to invest on other things like opening in new locations and rebranding themselves. There are plenty of other factors as well, for example, with so many varieties of food to choose from nowadays, it can affect people’s preferences. Not to mention that I personally heard some opinion noting that gado-gado is the food for older generations making it unlikely for current teenagers to choose as they often go for something hip and new. Nevertheless, Mr. Hadi is still proud of the historic stature that his restaurant has achieved after all these years and that media from both local and international companies keep on coming to cover his gado-gado, thus preserving Gado-Gado Bonbin’s existence further. “Last time, Bobby Chinn came here and the crew filmed him while assembling his own gado-gado. He’s such a funky fellow and kept on asking to enter the kitchen, but I said no”, said Mr. Hadi laughing cautiously, keeping his mother’s best-kept secret recipe. “Back then, we were actually a small grocery shop. As time went by, we decided to sell es cendol, specially made from soybean flour – not the usual rice flour that you will find anywhere else”, he said proudly. Furthermore, the grocery shop transformed itself to become a restaurant and known for other dishes as well such as lontong cap gomeh, asinan, and even their version of nasi rendang. The road will be long and winding from here but know that if the younger generation nowadays decide to preserve what their parents love best, traditional eateries such as Gado-Gado Bonbin will continue to exist and be loved for many generations to come. Weathering any storm and other tribulations over the years, Mr. Hadi and his family will continue to serve the best gado-gado and be ready to welcome anyone, anytime. It’s something that us, as their loyal customers, should support and appreciate always.